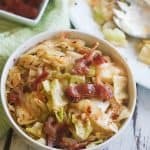 Southern Fried Cabbage – Simple, tasty , flavored with garlic and bacon -Ready in less than no time. Fried cabbage is actually a mixture of sautéing, and/or stewing, being cooked low and simmered in its own juices, rather than fried quickly. It is really not “Fried” so don’t be alarmed! Did you know that one cup of cabbage has only about 15 calories per serving? So if you are on a diet or just looking for a vegetable that will fill you up, you should put cabbage on your list. With that said, I am not going to try to convince you that this is the most healthy way of preparing cabbage cause it is not . 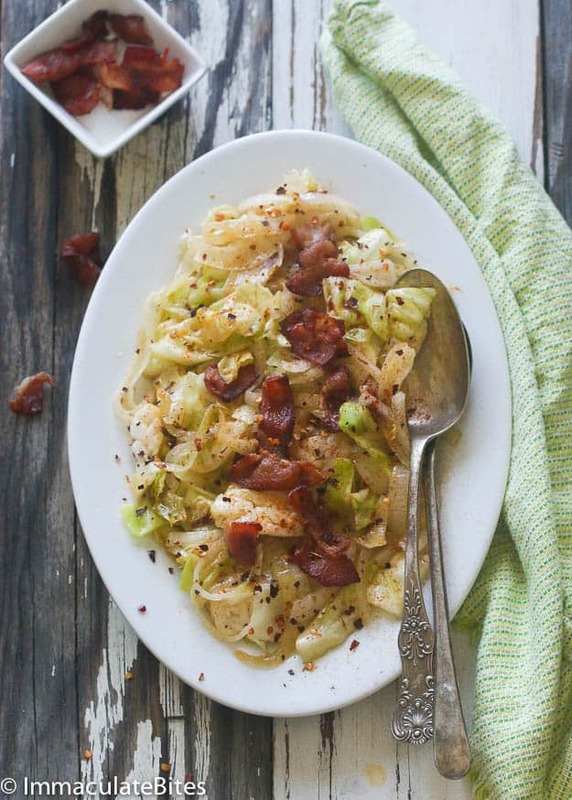 One thing am going to try to convince you do is make this fried cabbage because it is Absolutely Delicious! It features, garlic, bacon and onion as it ‘s flavor base and you have a lot of meat options – smoked turkey, bacon or smoked sausage- I love them all. Spice it up with pepper flakes and or chili and you are set. Another ethnic way of making this is using crayfish or smoked fish- as a teenage, I made this all the time using these rustic ingredients and added tomatoes and it was always a hit with the household. Paired with rice and/or plantains and it was early Christmas for all of us. This variation is one I was introduced to when I moved to the U.S, very common in the South, often referred to as “fried” cabbage and paired with corn bread and fried chicken – another heavenly combo. I like my cabbage cooked for about 10-15 minutes- not too long. If cooked for an extended time kills it for me. 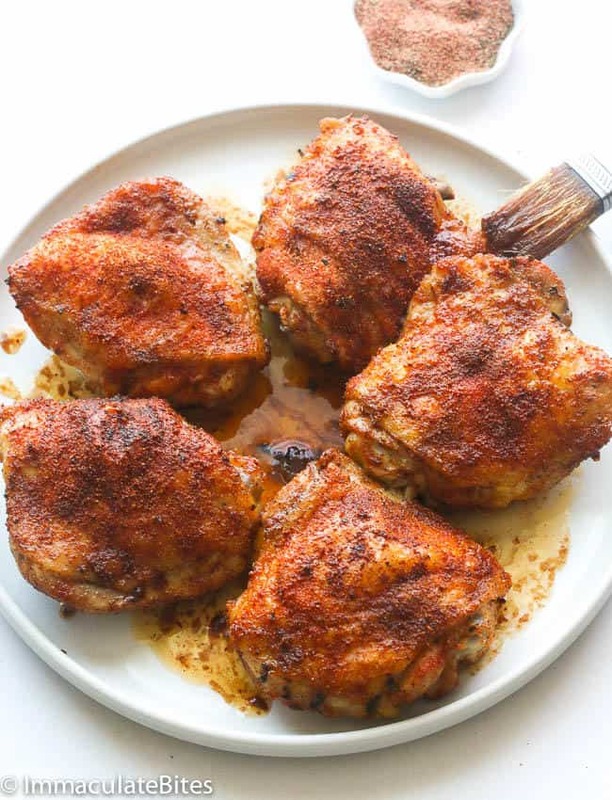 Serve as a side dish or with this Baked Crispy Chicken Creole Thighs and 20 cream minutes biscuit Enjoy! 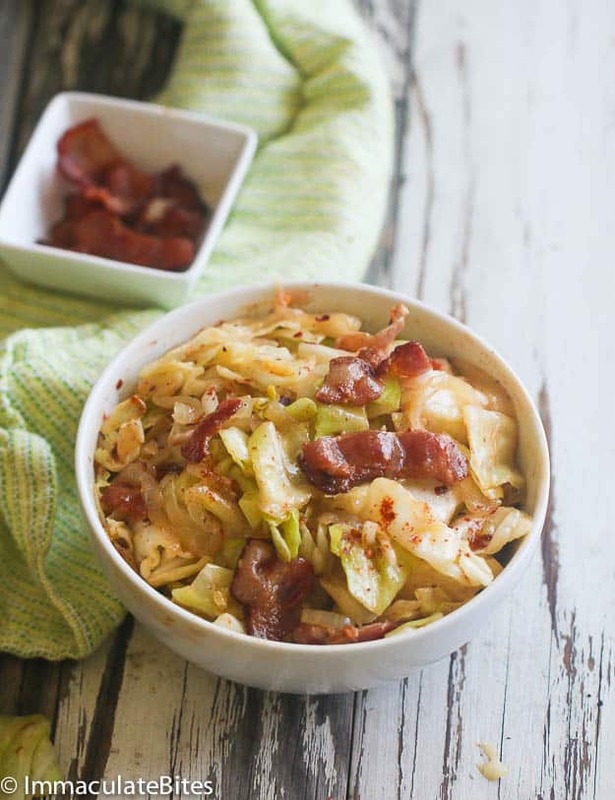 Southern Fried Cabbage – Simple, tasty , flavored with garlic and bacon -Ready in less than no time. Fried cabbage is actually a mixture of sautéing, and/or stewing, being cooked low and simmered in its own juices, rather than fried quickly. It is really not “Fried” so don’t be alarmed! 1 teaspoon creole seasoning or more adjust to taste. In a large skillet over medium heat, sauté bacon until brown and crisp this may take about 3-5 minutes. Set aside reserve about 1/4 or more for garnish. The rest to be use when adding the onions. Add butter to the pan. Followed by onions, garlic, paprika , creole seasoning and bacon. Let it simmer for about 2 minutes, stirring occasionally to prevent any burns. Then add cabbage, worchester sauce and white pepper, bring to a simmer, cover and let it cook for about 10-14 minutes or more depending on preference. Adjust for seasoning with creole seasoning ,salt and pepper flakes. Happy New Year to me! I was lucky to have found this recipe to make for my traditional family “new year” meal. It’s definitely my new favorite way to make cabbage. Thank you! Happy New Year to you Jaimee! So happy to hear it works out well for you. Do not make this. I’m warning you. You will wind up craving it every day. SO delicious. I have tweaked it and am bringing more friends to the dark side. YUMMMMMM! Hahaha! Thanks for the feedback Amber- So thrilled it worked out well for you. What tweaks did you make? 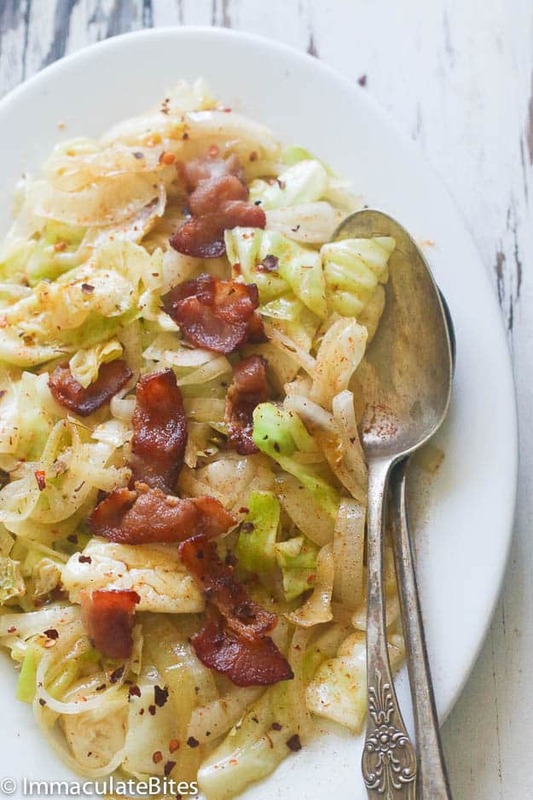 I am not big on cabbage, but I really like this recipe. Tweaked it just a bit, I used Smoked Hot Spanish Paprika and omitted Red Pepper Flakes. You still get that fiery tingle but the Spanish Smoked Paprika has a great smoky flavor that plays well with the bacon. Only other tweak was a teaspoon of sugar because that is the way my Mother did it to get that bitterness and sulfur out that I do not care for. Thanks for sharing those tips, Dereck! P,s. My lips are sealed – ZIP. Great recipe with just the right amount of spice. I did add a few more cloves of garlic because we love it. This will become my “go to” for cabbage. Just stumbled on your site today and made this cabbage and your cornbread…so good! Thank you! Awesome! Glad you like it, Kathy! That is very good. I use a pound of bacon per head of cabbage. I mince the bacon before I saute it. Then, I drain the crispy bacon keeping the grease. I saute the cabbage, minced garlic and julienned onions for 6 minutes in a huge pan and put it into a big bowl. 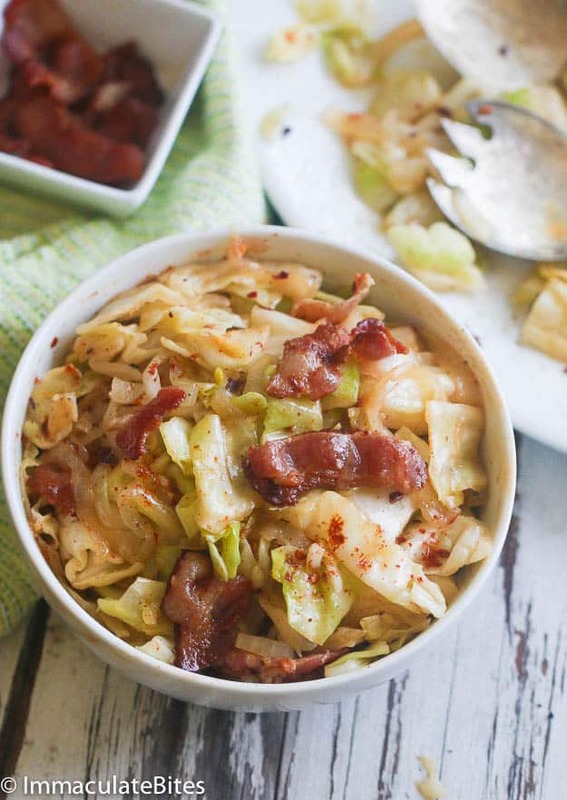 I love spice, so I splash some of my home made Carolina reaper sauce onto the cabbage mixture and toss witth the crispy bacon. This goes great with my bonless, skinless chicken thighs which I pound out, rub with adobo seasoning, let rest for 2 days and then dust in flour, eggwash then garlic bread crumbs. I fry those chicken steaks in peanut oil at 325 degrees for 6 minutes… Try that! This makes me so happy Scott! Thanks for trying this out . Also appreciate all the tips . Take care! Followed this recipe…it was delish!! I just made this and the baked chicken. Both came out perfect. I have 3 teenage boys and my husband to feed so I doubled it. They loved it. I have terminal cancer so I cannot cook very much anymore. These were so simple to make. Thank you so much!! Hi Kelley , I am so sorry to hear you are going through this . Glad to know the recipes worked out well for the family. I’m sending positive thoughts your way . God Bless. I get the Cole slaw mix and I add fresh processed jalapeno peppers and fine diced onion, then I use different kinds of salad dressing. Evo, garlic parmesan ,even ranch. Also I slice cabbage in about one and a half inch steaks , use garlic pepper and brush with olive oil and grill till marked. I found this fascinating to read. I come from a German/Russian/Mennonite background and we make cooked cabbage/onions as well but we cut 4 inch squares of dough, plop some of the cooked cabbage/onions mixture on top, fold it into buns and bake them. Some people substitute saurkraute and some people add cooked ground beef. I think I’ll try your recipe in a bun! That sounds amazing! What kind of dough? i pan fried some potatoes for about 8 minutes in bacon grease and then added this recipe to the pan – absolutely loved it! YES! Thanks for the feedback! I love this recipe. With bacon added I can get my fiance to eat it no problem. He loves the spice and I get to gobble up tons of veggies. It’s a Win- Win Sam!!! Hi, at what point do I add the paprika and pepper flakes? Also it doesn’t say to remove all bacon from the pan after cooking, just to reserve some for garnish. Do I keep the remainder in the pan? Looks delicious by the way! Recipe has been updated . Thanks Melanie. So, when did you add bacon? Updated recipe doesn’t say. I see to reserve some drippings after cooking bacon and to save some for garnishing. My bad! It’s been re written to make it clearer. Thanks for pointing this out to me Ronnie. Awesome! Also love it with sausage . Thanks! Where do I find your method for the scotch bonnet peppers. I would love to be able to add flavor and not heat. Hi Ann! Do you mean scotch bonnet sauce ? Isimeme says in the comment above that she used your method to add scotch bonnet flavor without the heat. I would like to know how to do that. try using smoked sausage such as Conecuh or People Pleasin instead of bacon! Delicious. A New Year’s favorite. What is creole seasoning??? And I love your work. Great recipes. Thank you. Thank you! !.Creole seasoning is just a combination of spices check it out here. You can buy in most super markets sometimes known as cajun spice. Thank you for the link! Most commercial Cajun season is too salty for me, so finding out what was in it let me make my own no-salt version (equal parts granulated garlic, ground cayenne pepper, ground ancho pepper, and black pepper). We’re having fried cabbage for Christmas, with both duck and ham, glazed carrots, green peas, and a couple other things. Trying to make the table as colorful as the tree! Oh WOW! That sounds Scrumptious. Thanks for taking the time to share this with us. Wishing you all the best of 2018. This was amazing. I’m a Italian man with a West Indian wife and I been amazing her with your recipes!! Thank you soo much. Your Amazing!! Awesome!!! Thank you so much for taking the time to share this with me. Nullacia, anything for you dear. I will have it up first week of May.And you can call me Imma anytime. You got me at “15 calories”! I think cabbage is one of the most underrated veggies in the world. People think of it as “boring” still but it is so versatile! It is the most commonly used veg in Asian stir fries and I always see it in recipes in the most unexpected places. I love this stir fry idea, it’s very different to the way I usually make it so it’s a great new idea! I always have cabbage on hand (thats the other thing, it lasts for so long!) and bacon in the freezer. Creole seasoning over here isn’t so crash hot but I’m sure I can use an acceptable substitute. Honestly, I would make just this for dinner! And I can see that adding potato would be fantastic – it would fill this out as well!